Sunday, August 10 was the date for the second planned SDRA weed pull event (Weed Pull II) of 2014. Beginning at 3PM and ending at 8 PM, the event was another great volunteer effort. 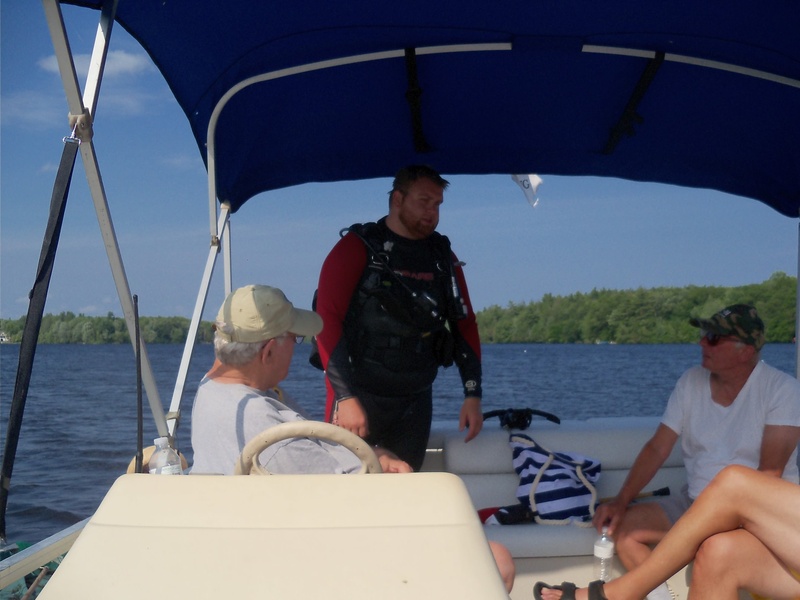 Well organized and well attended, 16 volunteers gathered together and proceeded with their supplies, boats, and assigned divers to areas of milfoil previously identified by Ray Theriault and Art Searle. 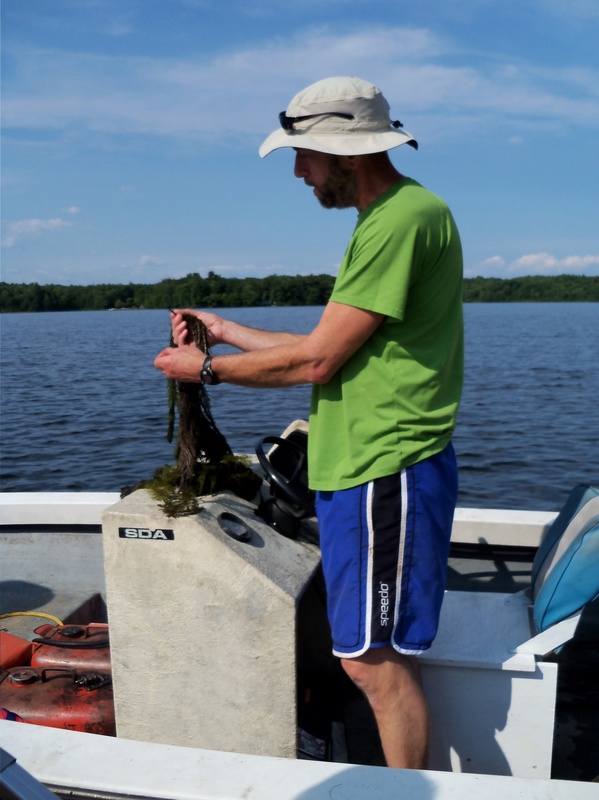 The four divers, led by James Newland, were prepped by Art Searle on what milfoil looks like and how to extract with its strong root system without creating too much fragmentation. 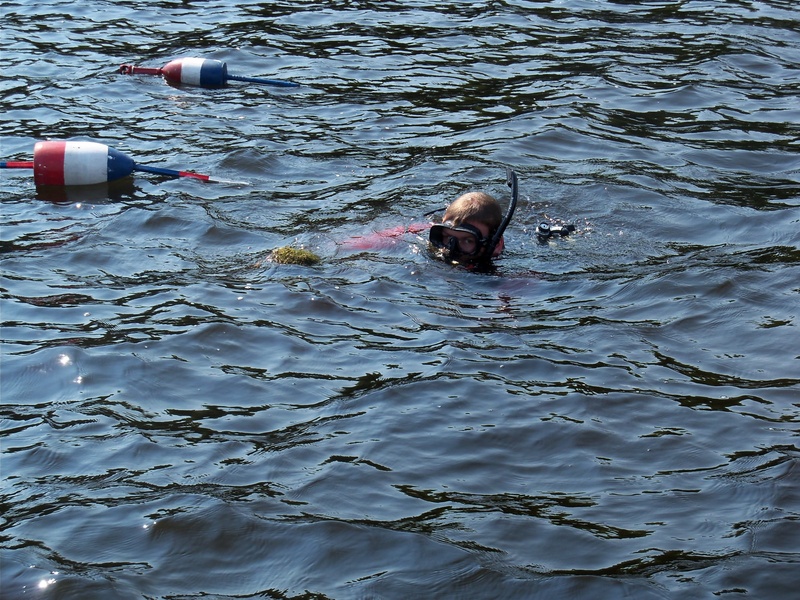 As the divers moved through their gridded areas significantly more milfoil was found. Large amounts of were extracted and loaded into the accompanying rowboats. 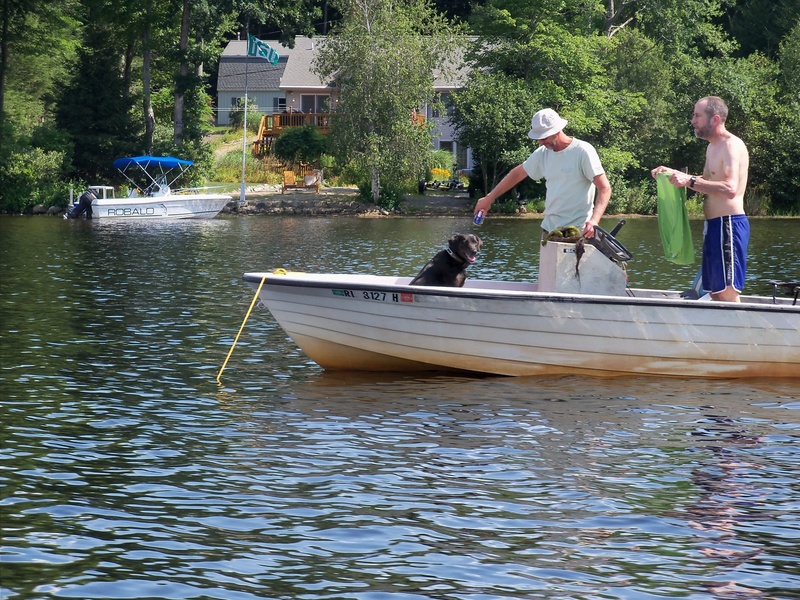 It was all deposited at various lakeside properties offered by the volunteers at the end of the day. Everyone who participated did a terrific job. The boat captains, Bob Bedard, Ernie Heon and Steve Hopkins managed to move everyone into position and continued to stay on point with safety. The boat assistants Cleo Monti, Deb Silva and John Guertin were also watching and communicating constantly with the men manning the rowboats. 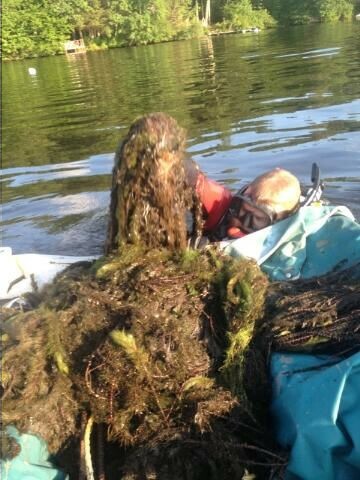 Rowers Kyle Theriault, Eric Lariviere, Sam Hawkes , his friend, Brendan, and Myles Silva stayed with their divers and worked well with them to make sure that milfoil was properly secured in the rowboats for disposal and floating pieces were captured. 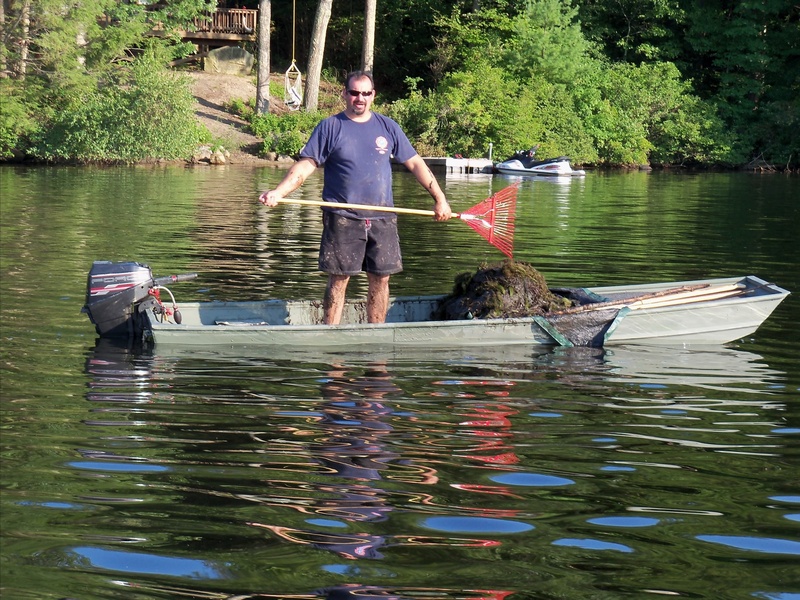 Pauline Finlaw was on call to relieve and assist the rowboats with milfoil transport. Art Searle and his brother, George, also dove for weeds and provided additional safety assistance. Mary O’Keeffe’s signage at the boat ramp was effective in assuring that no additional boat traffic obstructed the divers. Ray and Elaine Theriault provided needed boat surveillance and coordination of this extraordinary effort. 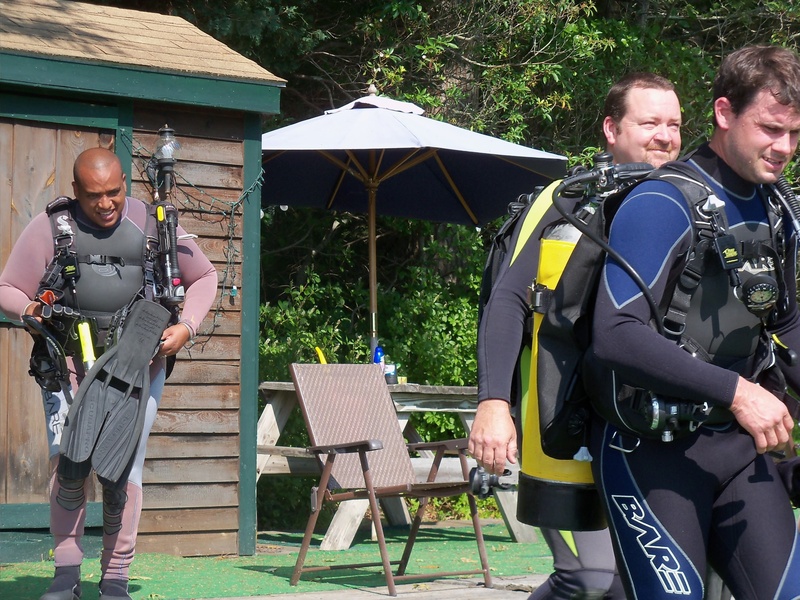 Sam Hawkes was instrumental in hiring the divers as well as organizing a celebratory pizza party at the conclusion of this four hour event. Rico provided 1000 feet of line and Myles Silva donated multiple pieces of rebar for the underwater grid. 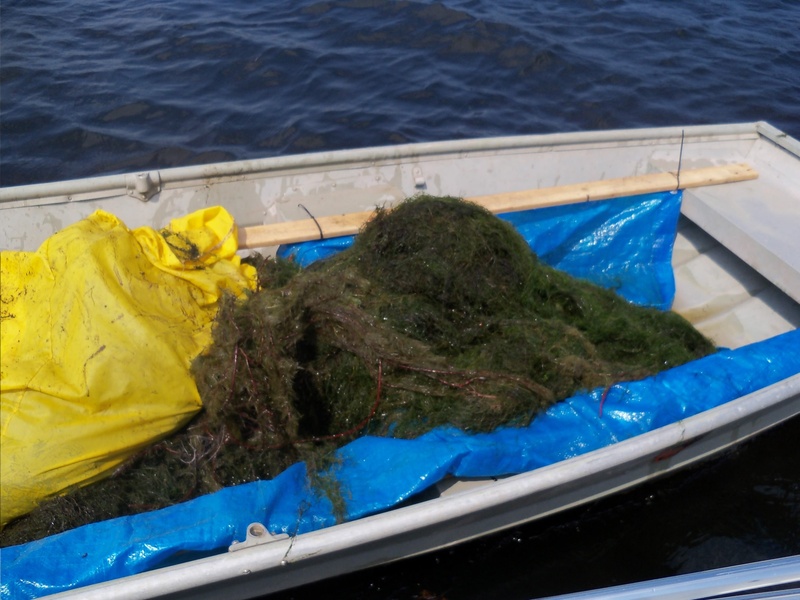 The resulting harvest was significant and contained only milfoil. The amount of milfoil identified by Ray and Art several days prior to the planned weed pull had tripled in volume by Sunday afternoon. The weeds were deep rooted and at times very hard to remove. The divers were persistent; returning over and over again to assure that the tentacle-like root ball was also removed. This SDRA Community project was truly a monumental effort and significant to the history of Sand Dam Reservoir. A heartfelt thanks has been extended to everyone who gave up their mid-summer Sunday afternoon to participate. This article was written and photographed by Elaine Theriault. 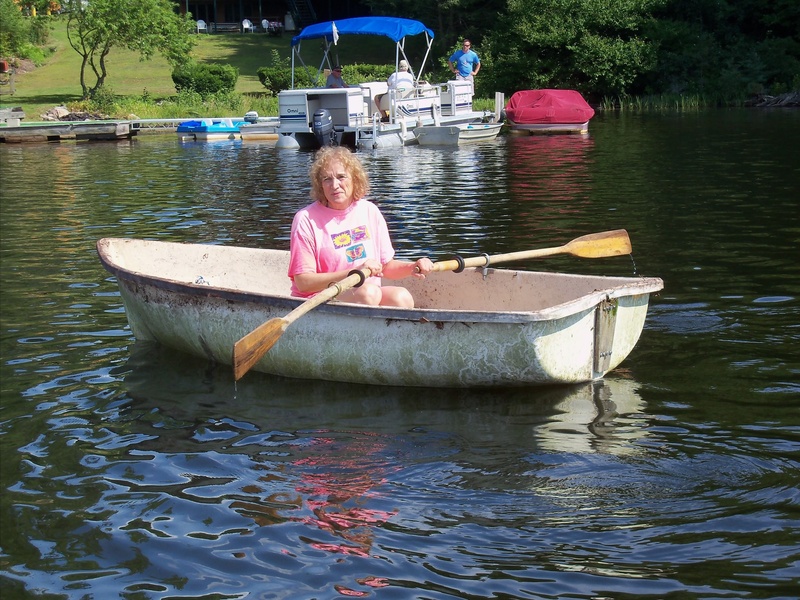 This entry was posted in Community Advocacy, Lake Management, Sustainability, Weed Harvesting, What's Happening. Bookmark the permalink.